A brand new, state-of-the-art CT scanner has been unveiled in the Radiology department at The Robert Jones and Agnes Hunt Orthopaedic Hospital (RJAH), following a £1million investment. Staff in the Radiology department say patients are already benefitting from the new piece of equipment, due to it being quicker and also producing higher quality scans. Resembling a giant Polo Mint, the machine can scan a staggering 320 slices per rotation, producing extremely detailed images that provide a diagnosis to help guide a patient’s care and treatment. In a bid to improve the overall patient environment, a number of ceiling tiles have also been transformed into a floral display to help put patients at ease, during their scan. Eric Hughes, Diagnostics Divisional Manager, said: “This new CT scanner will provide our patients with state-of-the-art scanning, which is quicker for them and also provides greater accuracy with improved image quality. The purchase of the CT scanner forms part of a £4 million programme of investments that the Trust announced, after it reported a surplus of £2.3 million back in April – made up of a £500,000 operating surplus plus £1.8 million in funds from regulator NHS Improvement, who allocate money called Sustainability and Transformation Funding (STF) to Trusts who hit their financial targets. The new piece of equipment replaces the existing scanner that has reached the end of its useful life. In recent weeks, staff have been receiving training to help them get to grips with the new scanner. 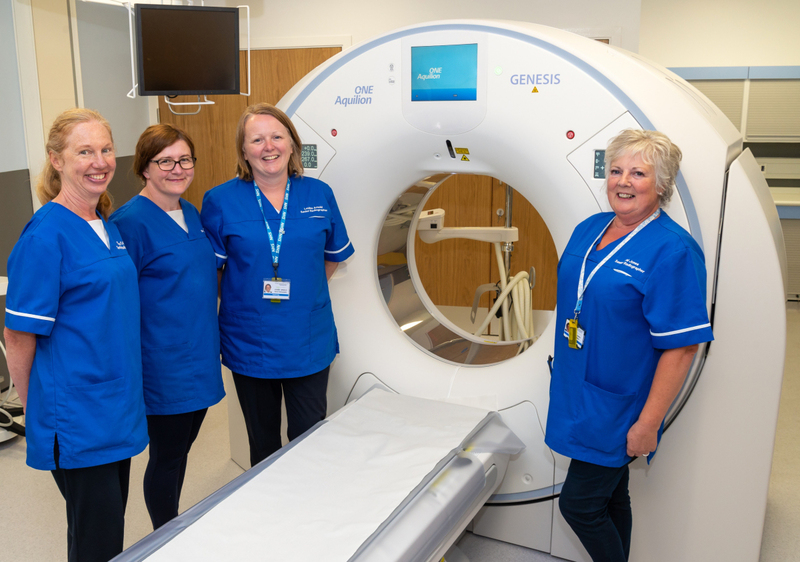 Val Jones, Senior Radiographer, said: “I know I speak on behalf of the entire department when I say we are thrilled to have our new CT scanner installed, it’s certainly been a long-time coming but it’s been absolutely worth the wait. Mark Brandreth, Chief Executive, said: “We’re delighted with this new piece of hugely important but also cutting edge piece of equipment, which will benefit our patients hugely, due to its speed and also the quality of the image it produces.